A new mother has some questions about (PKU). Which of the following statements made by a nurse is not correct regarding PKU? A Guthrie test can check the necessary lab values. Mental deficits are often present with PKU. The effects of PKU are reversible. A patient has taken an overdose of aspirin. Which of the following should a nurse most closely monitor for during acute management of this patient? A fifty-year-old blind and deaf patient has been admitted to your floor. As the charge nurse your primary responsibility for this patient is? Let others know about the patient’s deficits. Communicate with your supervisor your patient safety concerns. Continuously update the patient on the social environment. Provide a secure environment for the patient. A patient is getting discharged from a SNF facility. The patient has a history of severe COPD and PVD. The patient is primarily concerned about their ability to breath easily. Which of the following would be the best instruction for this patient? Deep breathing techniques to increase O2 levels. Cough regularly and deeply to clear airway passages. Decrease CO2 levels by increase oxygen take output during meals. A nurse is caring for an infant that has recently been diagnosed with a congenital heart defect. Which of the following clinical signs would most likely be present? A mother has recently been informed that her child has Down’s syndrome. You will be assigned to care for the child at shift change. Which of the following characteristics is not associated with Down’s syndrome? A patient has recently experienced a (MI) within the last 4 hours. Which of the following medications would most like be administered? A nurse is putting together a presentation on meningitis. Which of the following microorganisms has noted been linked to meningitis in humans? A nurse is administering blood to a patient who has a low hemoglobin count. 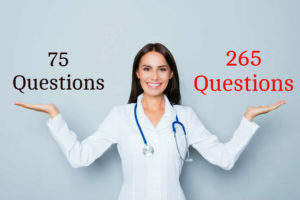 The patient asks how long to RBC’s last in my body? The correct response is. The life span of RBC is 45 days. The life span of RBC is 60 days. The life span of RBC is 90 days. The life span of RBC is 120 days. D The effects of PKU stay with the infant throughout their life. D Aspirin overdose can lead to metabolic acidosis and cause pulmonary edema development. D This patient’s safety is your primary concern. C The bronchodilator will allow a more productive cough. B Weight gain is associated with CHF and congenital heart deficits. C The skin would be dry and not oily. A Streptokinase is a clot busting drug and the best choice in this situation. A Green vegetables and liver are a great source of folic acid. D Cl. difficile has not been linked to meningitis. D RBC’s last for 120 days in the body.